Can you feel it? It’s that time of year! The weather is warming, the snow is melting and there is a fresh, sweet smell in the air. Spring is coming! It’s also the time of year to do a little spring cleaning and get that fresh smell in the air inside your Cleaning apartment as well. Unfortunately many cleaning products use harsh chemicals. Even some products labelled “green” or “non-toxic” can still contain hazardous ingredients. 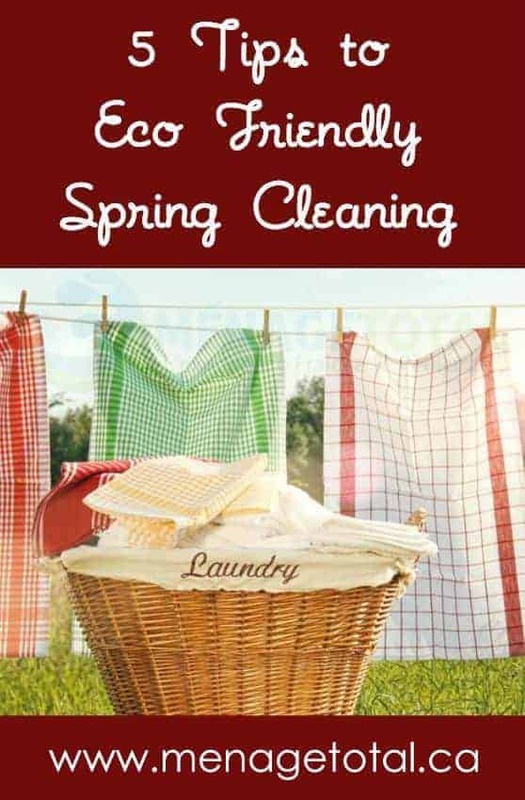 To help you clean up without leaving anything unwanted behind, the Menage Total Resident Services blog team presents 5 tips for eco-friendly Spring Cleaning. The Montreal based company Nature Clean features a full line of non-toxic, biodegradable and effective cleaning products, from dishwasher detergent to hands washes and all purpose cleaner. Their products are also designed for homes with allergy issues and free from common allergens like gluten, wheat, or nuts. Ecover has been around for over 30 years and has had one simple mission during that time: “to create powerful cleaning products that won’t harm the planet or the people on it.” They have a full line of Home Cleaning products as well as car and boat cleaners. For 27 years Seventh Generation has been a forward thinking, environmentally friendly company. Their mission statement is “to inspire a revolution that nurtures the health of the next seven generations”. They feature line of products made from renewable, plant based ingredients, including household cleaners, personal care products and baby products. The hydrogen peroxide that you probably have in your bathroom cupboard to clean skinned knees is a powerful cleaner that you can use throughout your home. It is diluted to 3% (97% water) so you can use it right out of the bottle on all surfaces in your kitchen and bathroom. It can remove stains and even cleans mirrors. Part of the joy of a good spring cleaning is to leave your home smelling springtime fresh. If you don’t want that smell to come from a laboratory. You can create your own DIY deodorizer in only a few minutes using lemon, rosemary and vanilla.